Warriors’ DeMarcus Cousins went down with an injury in Game 2 vs. Clippers in his attempt to run the ball to the other side of the court. 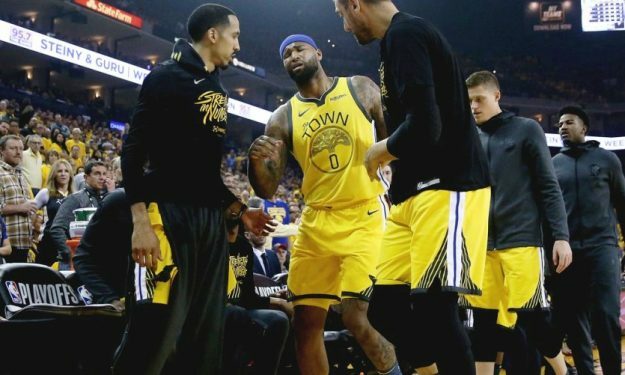 Golden State Warriors center DeMarcus Cousins went down in his team’s 135-131 Game 2 loss to the Los Angeles Clippers after suffering a quad injury in the first quarter. Cousins fell in his attempt to run the ball to the other side of the court with a steal, where he slipped on the court. The 28-year-old just returned to action this season after suffering a torn ACL and if the extent of his injury forces him to miss the rest of the playoffs series this would mean a huge blow for the reigning NBA champions.